Hoopuni ia e na pali. Surrounded by cliffs. 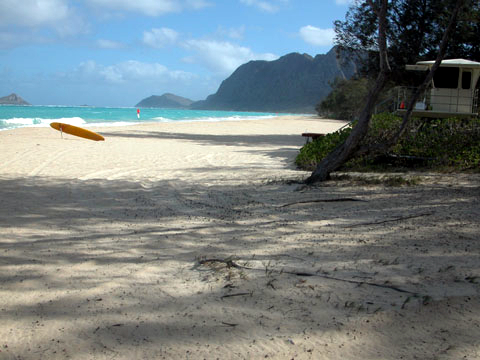 Waimanalo Bay, lined by the longest sand beach on windward O’ahu, is three miles wide. Bellows Field Air Force Station occupies the north half of the bay. In July 1966, seventy-six acres at the south end of Bellows were transferred to the State. This section of Bellows had been abandoned as a military recreational site in favor of the north end of the station in the 1950s. Heavily wooded with ironwood trees, this area became a popular spot for stripping stolen cars and other illegal activities once the military left. The activities of the gang that used the woods were compared with those of Robin Hood and his Merry Men in England, so local residents began calling the area Sherwood Forest. Today, the park is officially known as Waimanalo Bay Beach Park, but most beach goers still call it Sherwood Forest or Sherwoods. The beach fronting the park is long, wide, and sandy. A shallow sandbar at the water’s edge provides good waves for bodysurfing and bodyboarding. A typical windward beach, Sherwoods has an interesting array of marine life, including crabs and the stinging jellyfish, Portuguese man o’war. See the lifeguards for severe stings.